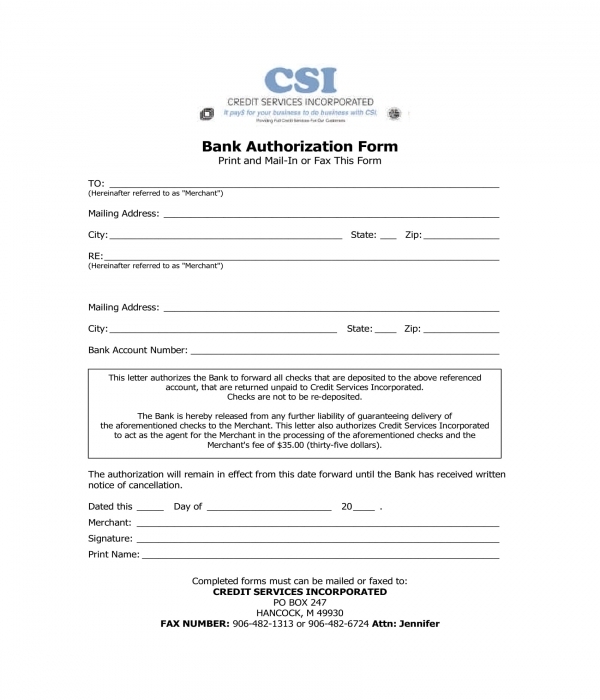 A bank authorization form is a document which is specifically used by banks to ensure that a claimant, as well as a depositor, is an authorized person who is legally permitted by the account holder to conduct a transaction associated with his bank account. Bank authorization forms serve as a tool that protects both the bank and the bank account holders by means of securing that transactions are recorded and are only executed when adequately proven and approved by the bank authorities. 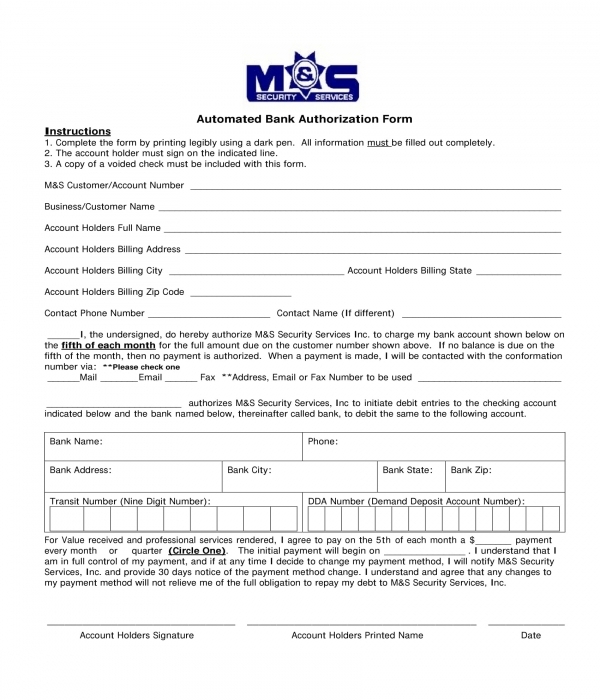 Automated Bank Authorization Form – This variety of bank authorization form is suitable for bank account holders whose aim is to permit an automatic transaction during a specific date in either a month or a year. The form will contain the details of the bank’s customer or client along with his billing information, and contact numbers. A statement which indicates when the transaction will be allowed is also incorporated in the form as well as the date of when the first transaction is expected to be conducted. 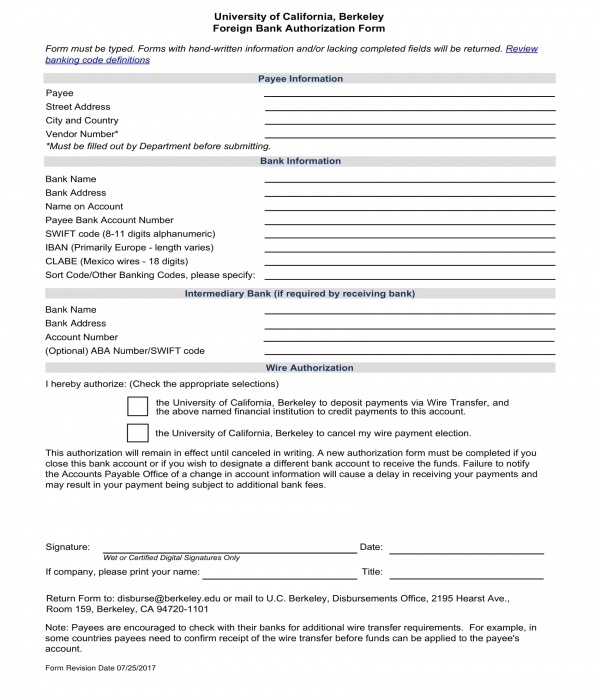 Automatic Bank Withdrawal Authorization Form – Identical to the aforementioned automated form, this document is also applicable to be used for automatic authorizations, however, it is only for a specific transaction which is for bank withdrawal. When used, the authorization form hints the bank that the client or the user of the form will allow his authorized party or entity to withdraw directly from his bank account automatically without the need of constantly signing an authorization form prior to the withdrawal procedure. The form is composed of four sections wherein the first section is where the client will be able to choose the type of transaction that he will be completed with the form whether to add an authorized entity or change his existing data entries. The second section of the form is allotted for the contact information of the client followed by the client’s banking information in the third section and the authorization statement in the fourth or last section. 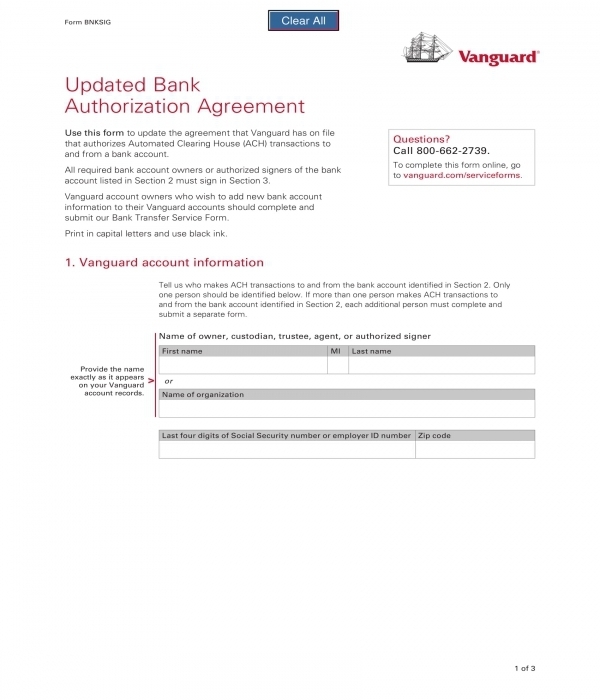 Bank Authorization Agreement Form – An authorization agreement form allows the involved parties to acknowledge rules and regulations that they are mandated to obey during the period of the authorization. Specifically, with a bank authorization agreement form, the client who is the bank account holder will be able to disclose details which are intended to be used by the bank organization for the authorization process. The client will also be presented with a list of terms and conditions, as well as limitations, which focuses on the authorization transaction and the termination of the authorization depending on the client’s requests and needs. 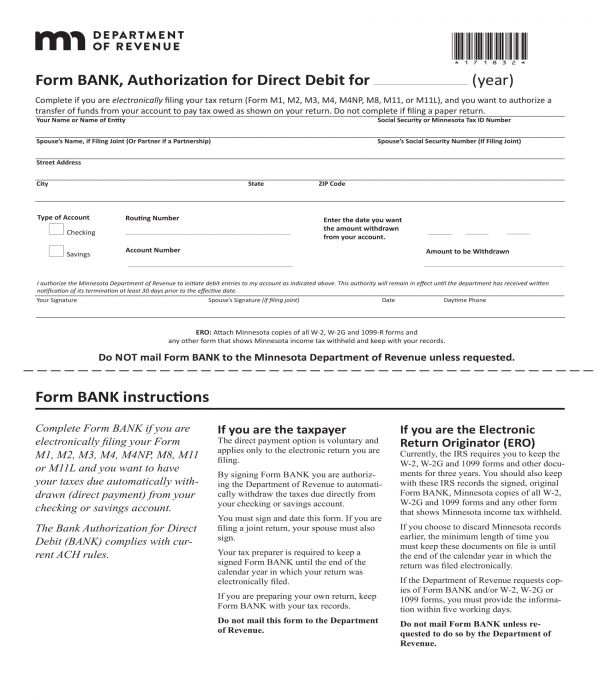 Bank Authorization for Direct Debit Form – For taxpayers, this form is essential to be filled out since it allows the bank to release or reduce the tax payment amount of their account holders who are also taxpayers during tax payment seasons and periods. 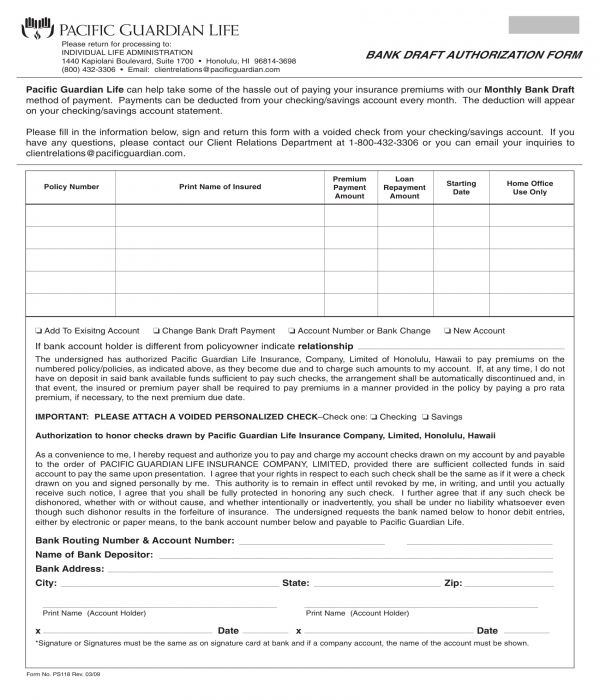 A bank authorization for direct debit form will state the name of the account holder along with the name of his spouse, significantly if they are holding a joint account, their street address, their social security numbers, the type of account to be used for the authorized transaction, as well as the client’s routing and account numbers. The date when the client wants and expects the amount to be withdrawn from his account and the specific amount are also important to be disclosed in the form. To complete the form, the client and his spouse should both affix their signatures with their daytime telephone number which will be used for calling them in events requiring immediate answers and clarifications about the authorization and the transaction. 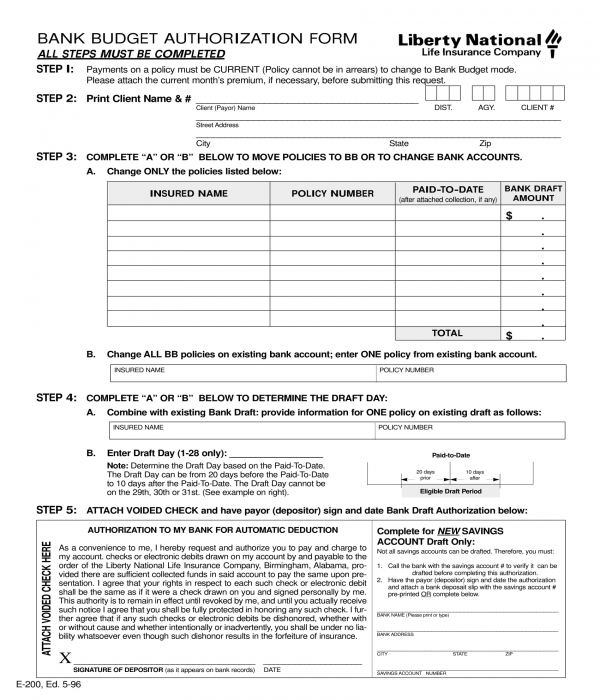 Bank Budget Authorization Form – This variety of bank authorization form is basically used by bank account holders who want to provide insurance payments directly from their accounts. The form will gather the client or the account holder’s name, the names of the insurance policyholders who will be paid by the client along with their policy numbers, individual paid-to-dates, and their bank draft amounts. An automatic deductions authorization statement must also be signed by the client to complete the form. 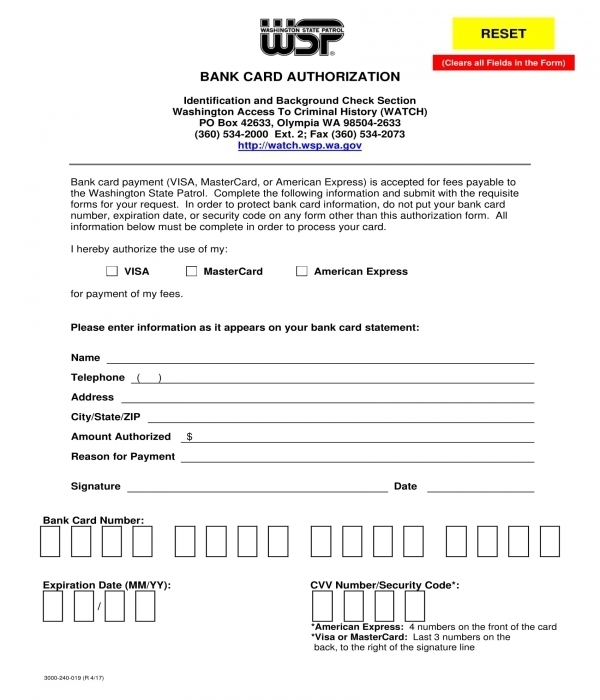 Bank Card Authorization Form – For bank account holders who are also card holders, a bank card authorization form is the appropriate document to use when needing to provide a payment through a bank card. In the form, the account or cardholder will have to supply his data including the type of card that he will be using for the payment, the bank card’s number, and even the card’s expiration date. The bank card’s security number is also required to complete the form in order to ensure that the card details are indeed the cardholders and that the transaction is legally authorized to be conducted by the bank. 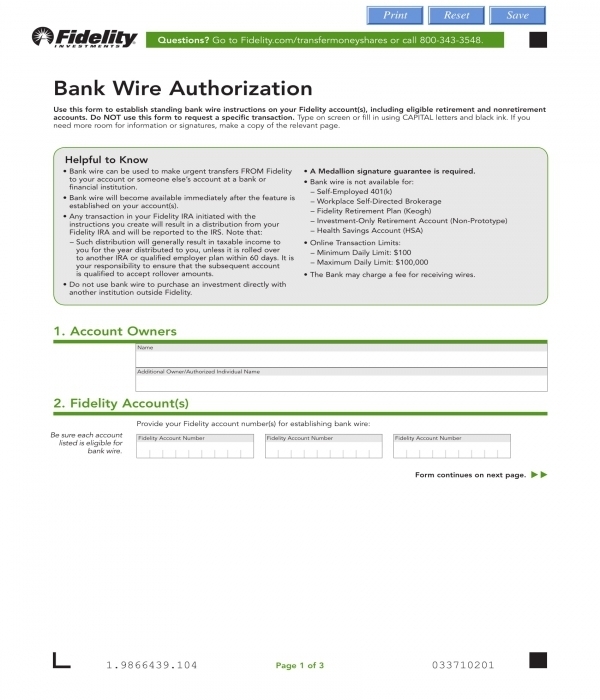 Bank Wire Authorization Form – A wire transfer is a type of transaction which allows a bank client to send an amount to another party from his bank account to the other party’s account without needing to be present at the bank organization. Wire transfers are often conducted with the use of automatic machines and even online applications. To permit a wire transfer, the client must fill out a bank wire authorization form and submit the document to the bank. This authorizes the bank to execute a wire transfer from one account to another. In the form, the bank will be able to have the details of their client’s account and the recipient of the transfer with an account certification and the signatures of the involved parties. Foreign Bank Authorization Form – Sending a payment from a foreign country requires the account holder to complete a foreign bank authorization form which will have the accountholder’s specific data and information. 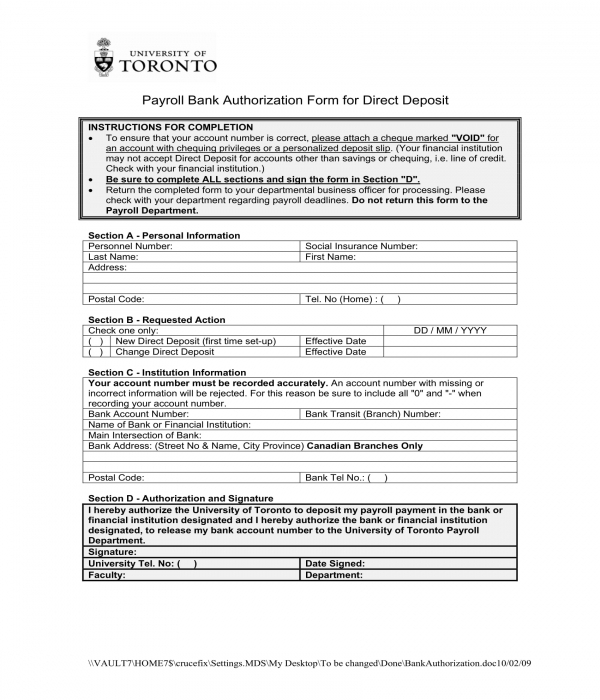 Payroll Bank Authorization Form – This variety is specifically intended for employers and employees. In this form, the employee will need to disclose his personal information such as his name, social insurance number, address and telephone number in the first section. On the second section, the employee will have to indicate the request that he will be completing while the third section will state the details of the bank where the employee’s account is registered. The last portion of the form will have the signature of the employee along with a payroll employee authorization statement. 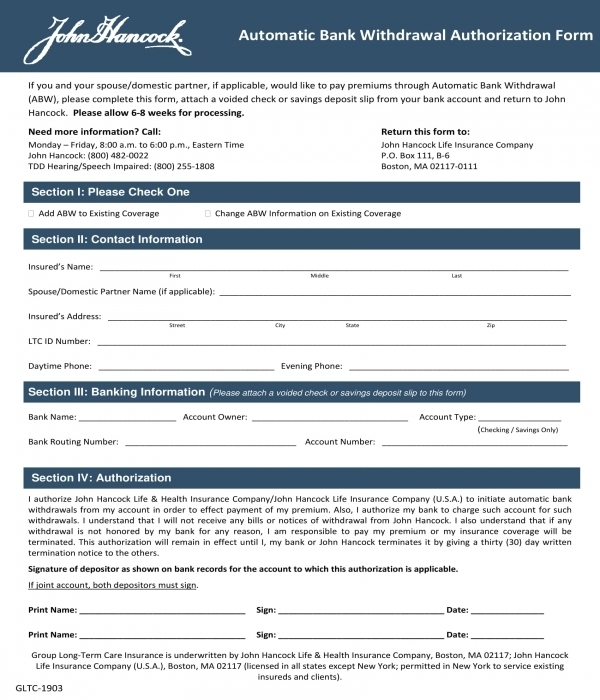 Bank authorization forms are not only used for banks but also for institutions and organizations who require their members and clients to supply a payment for either membership application fees or event payments. The form will serve as a proof for the organization to obtain the payment from their client from the bank with less hassle. Client information – This significant section of the form will be collecting the general information of the client who is connected with the bank or is an account holder. In this section, the client’s name, his account details, contact information, and the type of transaction that he will be allowing the other party to be authorized will be stated. Other party’s information – Who the other party or the authorized entity will be identified in this section of the form. In addition to the entity’s name, his address, and the name of the company where he is named as the representative are also needed to be included in this section. Moreover, the entity’s relationship with the client and the reasons why he is authorized are necessary to be defined to ensure that the authorization is conducted with ample and legal purposes. Authorization statement – In this statement, the client should indicate that he is allowing the bank to execute the transaction with the disclosed authorized entity. Additionally, a release of liability statement can also be included which is intended to waive the bank’s liabilities and responsibilities towards the execution of the transaction. Authorization particulars – This section will indicate the period when the transaction is permitted by the account holder and when it must be terminated. The limitations of the authorized entity will also be defined in this section. Signature block – This is where the client will be able to affix his signature and state the date of when he used the authorization form as well as when he submitted the document to the bank. In addition to the aforementioned contents and sections, a bank authorization form can also include an area where the particulars of the bank teller or the bank’s staff who handled the client can also be considered. This will allow the bank organization in determining who is the one who recorded the entries of the client during the authorization process.